Michigan dog owners are liable for dog bites and other injuries caused by their dog or other animal. In Michigan, there are two theories of liability, one is statutory, and the other is under Michigan’s common law. Under the Michigan Dog Bite Statute (MCL § 287.351), the owner of the dog is liable for the dog bite as long as the victim (1) was lawfully on the property and (2) the victim did not provoke the dog. (1) Knowing that the dog could be dangerous is irrelevant: Knowledge of the dog’s viciousness is irrelevant under the statute. The dog could have been well behaved its entire life, never before biting anyone. Under this statute, any bite can invoke liability. (2) You must be lawfully on the property: The owner of a dog will be liable if the dog attacked you while you were on either (1) public property, or (2) while you were lawfully on private property (i.e. you weren’t trespassing or committing a crime). In other words, if you were invited onto the dog owner’s property as a guest or a potential customer, then you were lawfully on the property and can likely recover for your injuries. 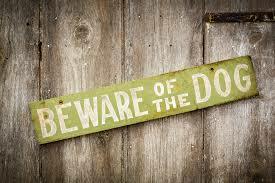 (3) The Defense of Provocation: The only defense the dog owner can assert is provocation. If you were bitten after you provoked the dog, then you may be barred from recovery. Provocation does not have to be done intentionally; instead, it can be done accidentally. In other words, you do not have to intend to anger the dog. If your act would have caused a regular dog to bite, then it could be considered provocation under Michigan law, barring your claim. Under Michigan’s common law, the victim only has to prove that the owner of the dog knew (or should have known) that the dog had vicious propensities. Under Michigan common law, the dog owner can be liable if he or she knows (or has reason to know) that the dog can be dangerous. This dog owner will then be liable if the injury occurred because the dog owner was careless by not putting a leash on the dog, failed to adequately supervise the dog, or did not use a proper sign to warn of the dangerous dog. A dog owner may be responsible for reimbursing the do bite victim for medical or psychological bills, pain and suffering caused by the attack, mental anguish, lost wages among others.